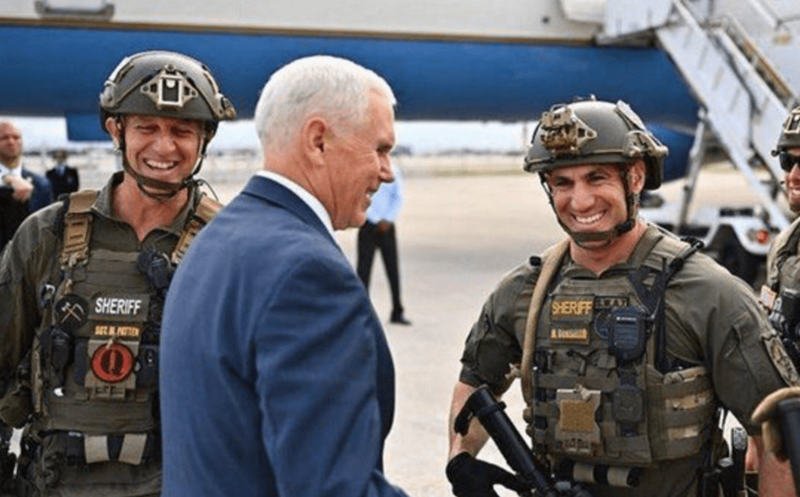 A Broward County Sheriff’s Office deputy has been demoted after he was photographed wearing a #QAnon patch while meeting Vice President Mike Pence last week. #QAnon is a far-right conspiracy theory popular with a small group of supporters of President Donald Trump. Patten received a written reprimand on Monday. He was also removed from the Sheriff’s Office’s Strategic Investigations Division’s Office of Homeland Security and from the agency SWAT team, Coleman-Wright said. Patten will be reassigned to the Department of Law Enforcement, she said. Broward Sheriff’s Office deputies greeted Pence at Fort Lauderdale-Hollywood International Airport on Friday after the vice president attended an event in Hollywood. The vice president’s staff took photos of the meet-and-greet and posted them on Twitter.